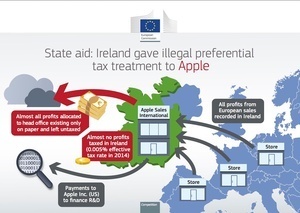 So the European Commission has concluded that successive Irish governments granted extraordinarily lenient tax benefits over the course of three decades to the American tech-company, Apple Inc., in order to secure its operational presence in Ireland. The commission judged that “selective treatment” of the corporation allowed it to pay an average tax rate of 1% on profits derived from the European Union. That particular figure dropped to as low as 0.005% in 2014, which meant that Apple was effectively paying zero tax to the Irish state while plans were being laid for the imposition of double-taxation on the Irish people through so-called water charges. The old political acronym of GUBU, grotesque, unbelievable, bizarre and unprecedented, springs to mind. Ireland, its like a Caribbean tax haven, just with less sunshine and more drugs…! Despite claims to contrary – by the coalition government and political establishment – Brussels has made it clear that the expected €13 billion in back-taxes from Apple for the period of 2004 to 2014 (plus up to €9 billion in possible interest) will be available to the Ireland to spend in whatever budgetary or capital investment manner it chooses. Of course the right-wing consensus is in full tilt against this unexpected judgement, one of the few occasions in world history were the leaders of a nation state actively avoid taking a no-strings attached windfall the equivalent of a sizeable chunk of their country’s gross national income (GNP). Much more here. The reasons given for not wanting the back-taxes now are ridiculous – it’s not like Apple will retain a particular fondness for us now we’re forced to start behaving like a real country from now on. So we refuse our rightful money and Apple also piss off away to Poland. €19 Billion! €19 Billion!!! This is the miracle money that could start wiping out the horrible mountain of national debt this generation left on our kids. I’ve gone past thinking the important people in government are bad at economics. I think Apple (as a multi-billion company) has undue influence on members of that government. Any investigative reporter (is there such a thing anymore?) worth his salt should be chasing around trying to find links between FG/Kenny/Noonan and Apple. Absolutely. Or it could go towards investing in our health service or schools. Hell, it would even pay to replace every water pipe in the country and build a couple of new water reservoirs to boot. Or, with more long-term planning, start a green energy strategy for the island that could supply not just our needs but those of north-western Europe. We could become for green energy in the EU what the North Sea is for petroleum energy. However I suspect, if handed the full €19 billion the politicos would piss it all away. There must be folk around FG and FF rubbing their hands with glee at the thoughts of getting their grubby mitts on some of the possible share out. It will be Irish Water all over again. Ireland should take the money and then never do business with foreign corporations again. The business part I don’t mind. Even a lower corporate tax I can forgive for the sake of economic necessity. Its the near-zero taxes that shock and stun. It’s the Bonofication of Irish taxation and society.